Northern (Rhondda) Colliery - mid 1960s by Barry Howard. These men worked in the local mines and these interviews give a vivid picture of their working lives. Recorded 17 October 1993 - Part 1/1. Fred Franklin (1922-1991) & Billy Nolan - Mineworkers, Aberdare No. 7 Colliery. Recorded 1 March 1990. Ken Hartcher (1918-2013) - Mine worker. Recorded 28 January 1994. Part 1/1. Des Hurn - Fitter, Ellalong Colliery. Recorded 20 February 1991. Lyle O'Connell - Mine worker. Recorded 9 February 1988. Hunter Orchard (1935-2009) - Braceman. Recorded 1 September 1991. Alec Orr - Sidler & contract miner, Maitland Main Colliery. Recorded 27 July 1992. Jim Orr (1908-2001) - Mine worker and football enthusiast. Reg Osland (1903 - 1995) - Timber getter and miner. Recorded 8 June 1982. Darcy Owen - Wheeler, Maitland Extended and Ayrfield No. 3 Collieries. Harry Parker (1905-1997) - Clerk, Stanford Main Colliery. Jack Peters (1906-1998) - Miner, Aberdare West Colliery, and early official, Cessnock Vigoro Association. Roy Philp (1919-1985) - Carpenter, Bellbird & Aberdare Extended Collieries. Recorded 2 November 1982. Norm Pike (1924-2011) - Mineworker, Maitland Main Colliery. Recorded 26 July 1992. David "Dai" Price (1893-1996) -- Mine worker, Aberdare Extended Colliery. Tom Rennex (1904-1991) - Mineworker, Aberdare Colliery. Recorded 4 December 1983. 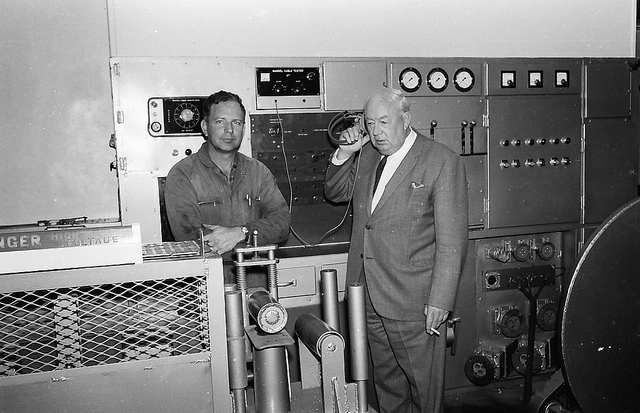 Ken Robertson - Engineer & Inspector of Mines. Recorded 8 April 1982. Catherine and George Ross - Bellbird residents. Recorded 4 April 1983. Bob Rutherford - Shiftman at Bellbird Colliery. Recorded 1 December 1983. Jimmy Rutherford (1903-1996) - Wheeler, Bellbird Colliery. Recorded 9 April 1990. Henry Scanlon (1902-1987) - Miners Federation official. Recorded 10 February 1984. Trevor Scarlett (1915-1994) - Mineworker. Part 1 of 1. Tom Shanahan (1893-1986) - Mineworker, New Greta Colliery. Recorded 3 June 1984. Maurie Shaw (1929-2007) - Engine driver, Paxton Colliery. Recorded 18 December 1991. Harold Slade (1903-1998) - Miner and pottery worker. John Slater (1916-2012) - Mine worker. Recorded 14 January 1994. Sid Smith (1891-1987) - Welder. Recorded 6 February 1984. Colin Stone (1914 - 2004) - Mining Industry. Recorded 29 April 1988. Ian Sumner (1915-1999) -- Fitter, Kalingo Colliery. Eric Thompson, Mine worker, Pelton Colliery. Recorded 1 May 1991. Ron Thompson - Welder, Paxton Colliery. Recorded 10 February 1992. Part 1/1. Dennis Thomson - Loco driver, [Bellbird Colliery]. [n.d.]. Jack Thomson - Mineworker, Maitland Main Colliery. Recorded c. 1989. Arthur Threadgate (1912-1991) -- Mine worker, Bellbird No. 2 Colliery. Recorded 9 November 1990. Les Vaisey (1906-2005) - Mine worker. Aub Vernon (1918-1996) - Clipper & wheeler, Bellbird Colliery. Roy Vernon (1908-2004) - Undermanager, Bellbird. Merv Walters - Fitter, Aberdare No. 7 and Aberdare East Collieries. Recorded 4 February 1990. Don Watson - Mine worker. Recorded 11 January 1988. Russell Watson - Mine worker. Recorded 4 March 1988. Noel White - Chief surveyor in the mining industry and NRL representative. Harry Wile (1915-2001) - Miner, Cessnock No. 2 Colliery. Recorded 16 April 1990. Jack Wood (1908-1984) - Mine Worker. Recorded 7 February 1978. Allen Wright (1918-2007) - Mineworker, Bellbird & Aberdare Collieries. Recorded 18 November 1981.